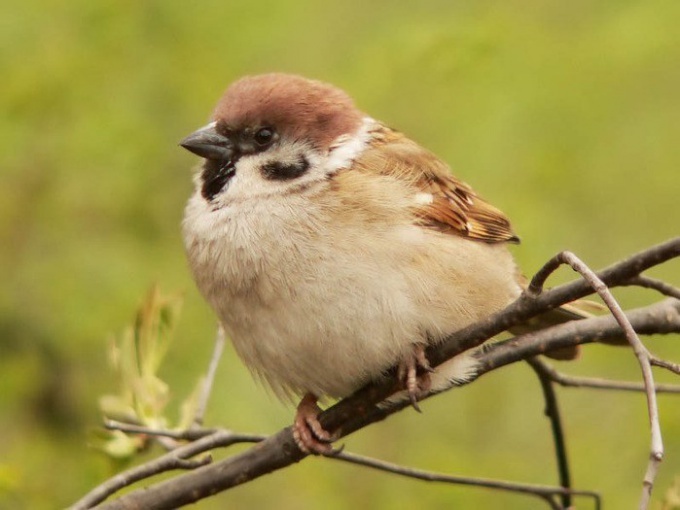 The sparrows become unwelcome guests in the garden or in the garden in the ripening period, when they peck everything that turns red, yellow or green. To protect garden beds, fruit trees and berry plantings, you can use noise devices, built it yourself. To protect the garden, fruit and berry trees, stretch fine mesh. It's enough to build easy wooden frame and fasten to it the enclosing mesh. This does not scare the sparrows, but will help to protect crops, as the birds just can't get under the fence. However, this method complicates the care of plantings and creates additional difficulties at harvest. To scare away the birds use the noise of the device. To build them in different ways. Hammer around the perimeter of the garden or garden stakes, stretch a clothesline. Cut into thin long strips tin cans for energy drinks, beer, lemonade. Attach it to the hanging rope. With the wind tin tape will make a knock that will not only scare away the sparrows, and crows, magpies and other birds. No less popular stun device can be made from the tapes. Pull the tape between the set stakes, it will fix a lot of small ribbons. Even a small breeze will flap flowing ribbon, they will rustle and shimmer. This device also repels sparrows. Instead of tape, and tin cans use colored plastic bags. Mount them on a stretched rope. The effect of noise, scaring the birds, will be not worse. More complicated noise device is made of two wooden disks, rope and metal tube. Such a device you can buy in the store Oriental goods. This melodious bells, used for ritual dancing and singing. At all times gardens and orchards were established Scarecrow. The method of manufacture is extremely simple. To a long pole crosswise fasten a short pole. Dress constructed Scarecrow in bright clothing, top and sides attach the color-coded plastic bags. 1 hundred need 1 Scarecrow. This will help to scare away all the birds that harm, obkladyvaya harvest. To the present time invented many ways to scare away birds, for private use of these funds (for example, in suburban gardens), and with more serious purposes, for example, on the ground. These devices are diverse in efficiency and scale of use, each has its pros and cons. Some of them can be done independently at home. 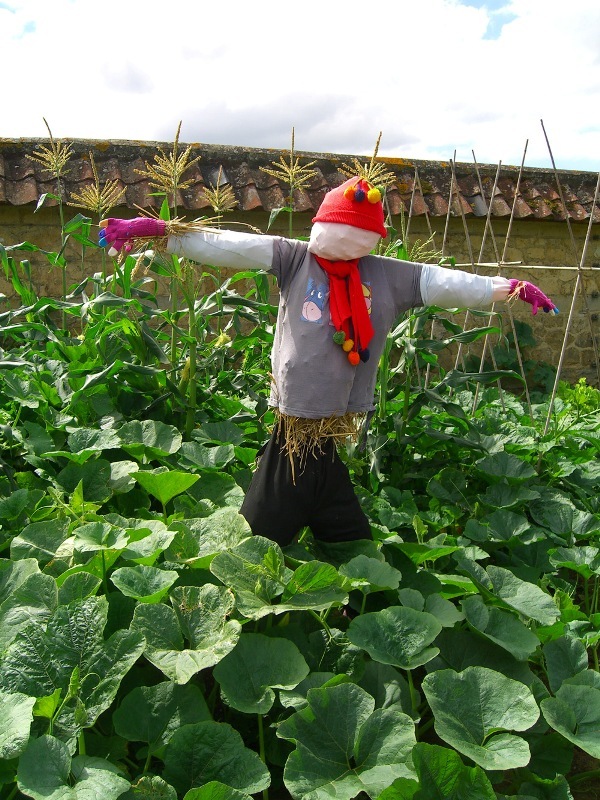 Scarecrow in the garden – perhaps the most famous and popular way to ward off unwanted birds. The Scarecrow is often done in the form of human figures out of old clothes. In addition, a bogey can serve a variety of devices that produce any sounds (bells, rattles). Also birds can chase away the reflection and Shine (old CDs, mirrors, shiny tape, foil). Another type of Scarecrow for the birds – Scarecrow predator, for example, kite, hawk, Falcon, owl. Another way is hunting rifle. Shots, even in the air, able to scare off crows and other birds, however, there are birds which such a method is not valid. More serious measures include, for example, bio-acoustic devices that mimic the cries of birds, who warn of the danger. It is a humane and ecological way of dealing with the birds. You can also buy laser repeller, which is a portable device that generates laser radiation in the red and green range. Minus bioacoustics and laser repellents is their high cost, which does not always pay off for the usual summer cottage. More accessible are ultrasonic scarers. Ultrasound has no effect on humans, but causes discomfort in birds, and they leave the territory. Gas gun with a loud shots effectively repel birds and animals. Minus of this method – frequent shots become an irritant to neighbors. In addition, birds are able to adapt to repetitive loud noises. Pets can also help in the fight with the birds, ruining the garden: dogs barking chasing intruders, and cats with a fun hunt. Sparrows are omnivorous birds. That is their benefit and their harm. Feeding on pests, they protect plants and trees from harmful insects. However, they eat also fruits, and grain, which leads to the fact that they obkladyvajut fruit trees and the crops in the fields. - ultrasonic pest repeller birds. Put in a bowl of cereal and sprinkle it with red pepper. Mix thoroughly so that the pepper is evenly distributed among the grains. 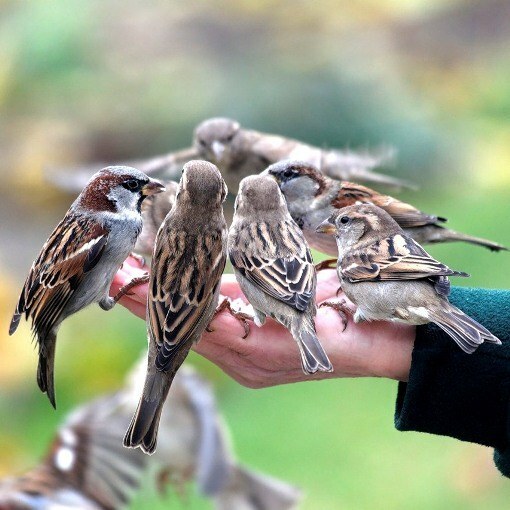 Sprinkle a few handfuls in the places where are usually collected by the sparrows. If they peck the grain from arable land or raised beds, try not to pour this mixture all the land in a row, and put it in a conspicuous place to attract the attention of sparrows. Repeat this procedure for 2-3 days until the sparrows will not know what to peck at what's growing in your yard inedible. In those places where sparrows and in need of protection, bind to the CD thread and hang them at a distance of approximately 10 cm from each other. Next to them hang bunches of Christmas rain. When the wind kicks up, the discs will start to tap against each other, and Christmas tree rain begin to rustle. 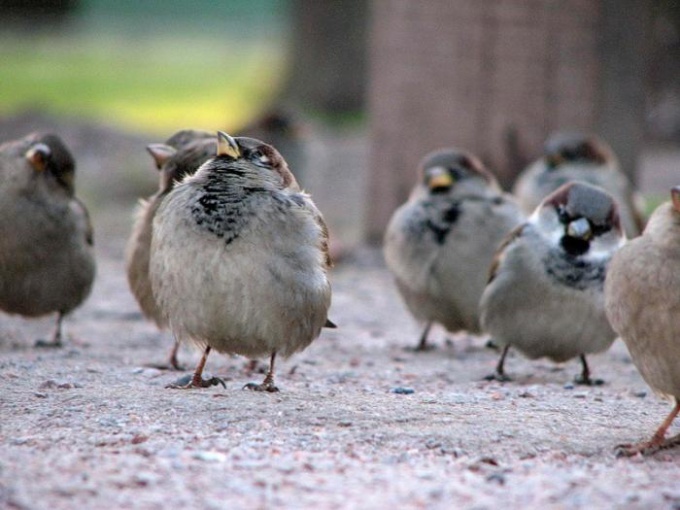 These sounds scare off sparrows, but in calm weather, such devices are ineffective. Pour into the open a little grain. Tear a piece of paper into small pieces and moisten them with water. Roll from them balls, open air rifle, charge them in the barrel with the muzzle, and only then get her ready to fire. Wait for arrival of sparrows, wait, when they gather together near the cereals and start to fire. Scraps of paper, unlike lead pellets, will not cause them serious harm, but can scare. Repeat these ambushes through uneven intervals. In a garden or country store buy vegetable mesh (also called mesh from birds). Cut it into desired pieces and tighten her cages, pull over the beds and wrap the trees with shrubs. This will not discourage sparrows from your plants, but will significantly hinder rasklinivanie. In specialized stores or online, buy it Birds Free, and coat them around the area you want to protect them from sparrows. This harmless gel that glows in the ultraviolet range and scares all the birds. Another option – buy ultrasonic bird repeller, turn it on and install to a territory with a radius of 20 meters around it was part in need of protection areas. The good old Scarecrow is unlikely to be useful from sparrows. It performs the same function as rain, and Christmas with CDs, but is made much longer, harder to install and takes up more space. Birds in the garden are able to bring benefit and harm. They kill not only harmful insects, but can damage seedlings, fruits and berries. To protect their crops from birds, gardeners can purchase a special device in the store or make a simple device with their hands. Manufacturer Scarecrow for a garden plot does not require you to serious money. Its quick and easy to make from common materials that can be found in the country. Two sticks Unscrew Phillips. Instead of a head attach on the shoulders of the Scarecrow bucket, old pot or ceramic pot. From top to hoist hat with a brim. Make a waving clothes from the robe or cloak. Hung on the neck of the doll's string of tin cans. 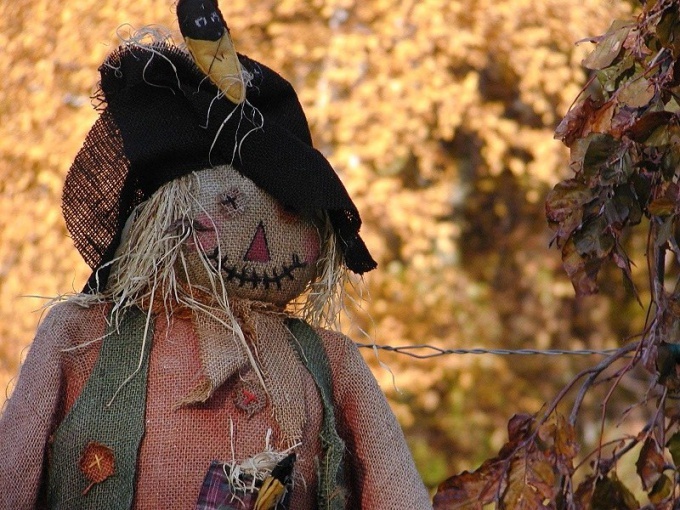 If you approach making scarecrows with enthusiasm, resulting the doll can decorate the garden. Make the body garden crafts made from fabric, stuffed it with straw. Draw eyes and mouth with paint, eyes you can still make buttons or by application of felt. Fluffy eyelashes are cut from pieces of skin. For clothes are ready made pants and shirts. A lot of damage is done by the sparrows and other birds fruit trees and shrubs. Hang on their branches, shiny objects, then birds will avoid to get into these places. To scare away suited old CDs and DVDs, which are attached with fishing line. You can hang your film to videotape, it will rustle and flutter from a slight blow of the wind. For the same purpose and fit the foil, cut into strips. It is not only flying, but also creating a glare that will scare the birds. The original decoration of the suburban area and protection from birds will be mirror balls that you can hang on trees. For their production will need a small plastic or hard rubber balls, large plastic Christmas balls or made their own billet out of papier-mache. Cut unwanted CDs or DVDs into squares scissors. Glue them to the spherical basis and hang on the branches. A ball or balloon you can just wrap foil, securing it with glue. Purchase shop ultrasonic scarers. For humans, these devices do not cause inconvenience. The birds feel uncomfortable and flies around the plot side. The range of the ultrasound depends on the model of the device. Ultrasound can affect sensitive people, so it's best to use it away from human habitation. There are sonic repellents, which are equipped with motion sensors or included after a certain period of time. They emit cries of birds of prey. In stores for gardeners get a special grid. They snapped at bushes or small trees, then the birds get to the fruit.